Audiobooks are now a billion-dollar industry, so it came as no surprise when Canadian e-book seller Kobo embraced the business a few months ago. So, is its new audiobook service a real page-turner? TravGear knows plenty of drivers who never pick up a book any more, instead listening to audiobooks while they commute or travel. 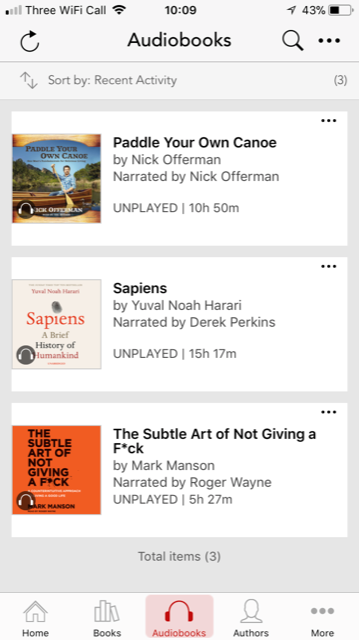 Obviously, it’s all now done by smartphone, so Kobo has built-in a new audiobook service into its app that’s a little different to how the Amazon Kindle works (which has a separate Audible audiobook service). It’s not cheap. At US$9.99/UK£6.99 per month for one credit – i.e., one audiobook – per month, this is an expensive service, there is slightly cheaper than Audible. Both have a free 30 day trial. OK … but who wants to listen to an audiobook EVERY month? There are so many podcasts, live radio, and music. Who needs another monthly chore on their digital to-do list? TravGear doesn’t. Still, Kobo’s Audiobook service does work really well in the car. Once you have chosen the title that you want, you get a full-screen treatment of the book, and figures for how many minutes have elapsed since the beginning of the chapter, and how many minutes remain. You can fast forward and rewind by 10 seconds by touching the left or right of the screen, and it’s even possible to speed up the narrator to a maximum of 2.75 times. All good stuff. It works well long journeys, too; at the end of each chapter, it simply plays the next chapter. That means less fiddling around with your phone when driving. It’s also possible to set the app to go to sleep in 15, 30, 45 or 60 minutes and, even better, the app can be set to go to sleep at the end of the current chapter. Again, impressive stuff. Despite all of this excellent functionality, we can’t help thinking that Kobo’s audiobook service is a little confused; the pricing appears to be geared only towards voracious readers (single titles are very expensive), while a truly tiny selection of titles – just 50, and most of them crime-orientated – will suit only those who buy one or two ebooks per year. So who’s the target market? Most people won’t have heard of most of the titles. The app is great, and the way the audiobooks work is hard to fault. But with a poor selection of audiobooks and high prices for downloading single titles, Kobo doesn’t add much to a market screaming out for a good value single title audiobook supplier.